This frame was shown at the International Exhibition in London in 1862. The Museum bought it directly from the exhibition for £75. At that time the Museum bought many modern pieces that demonstrated fine craftsmanship, to serve as inspiration for modern designers and carvers. Professor Pietro Giusti exhibited several carved frames in a similar style, and was awarded a medal at the exhibition. All the frames were carved, as this one is, in the style of about 1500. Siena had always been famous for wood carvers. There were several carving workshops there in the middle of the 19th century, when woodcarving was undergoing a revival all over Europe. They produced fine-quality work in historic styles, mainly for rich, middle-class customers. The finer details of the carving are shown in relief against a gilded ground. At the 1862 International Exhibition Giusti exhibited the frame together with the painting of the Virgin and Child with the Infant Baptist. Although the painting is contemporary with the style of the frame, it was heavily over-painted in the middle of the 19th century. A frame of tabernacle form, with semi-circular pediment, carved in walnut, with panels of Renaissance ornament in relief against a gilded ground. Height: 240 cm approx., Width: 94 cm approx., Depth: 20 cm approx. Waring, J. B., Masterpieces of Industrial art and Sculpture at the International Exhibition, London, 1862 (London, 1863), plate 225 and text opposite. Rowell, Christopher. "The Kingston Lacy 'Raphael' and its Frame (1853-56) by Pietro Giusti of Siena", National Trust Historic Houses & Collections Annual, 2014 (National Trust / Apollo, 2014), pp. 40-47, reference p. 44 and p. 47, note 55. Professor Giusti ran a large workshop including ten carvers in his native Siena, a town famous for wood carving. 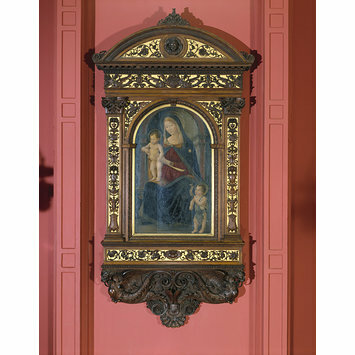 The design of this frame is derived from 16th-century Tuscan carvings. 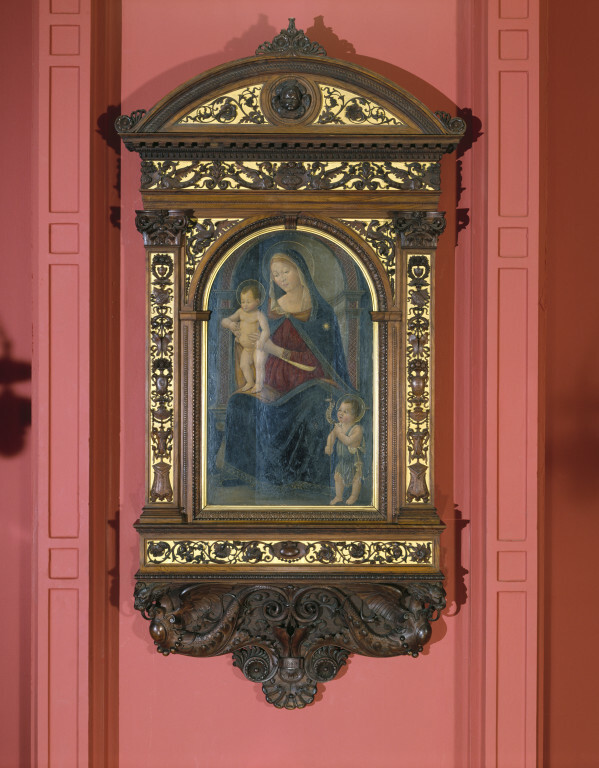 The painting is a panel of about 1500, later heavily restored, which Giusti incorporated for display purposes. The Museum bought the object as an example of high-quality carving.